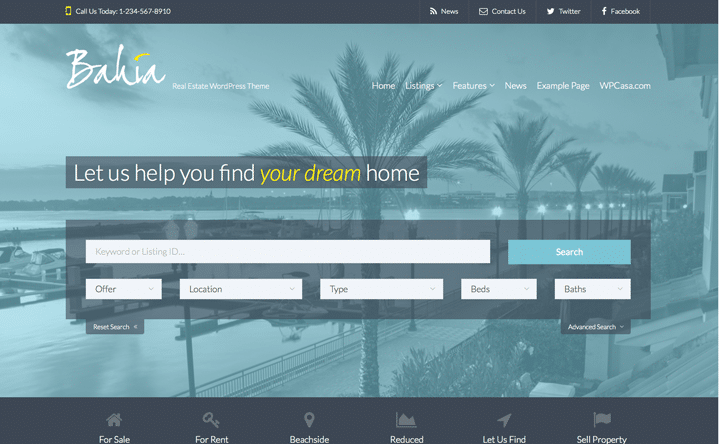 Are you looking for the best WordPress real estate themes? The real estate business is highly competitive, and sometimes all it takes to get ahead of the game is a great-looking website! However, while that sounds simple enough in theory, it can take weeks to look through the thousands of themes available to find your perfect match. 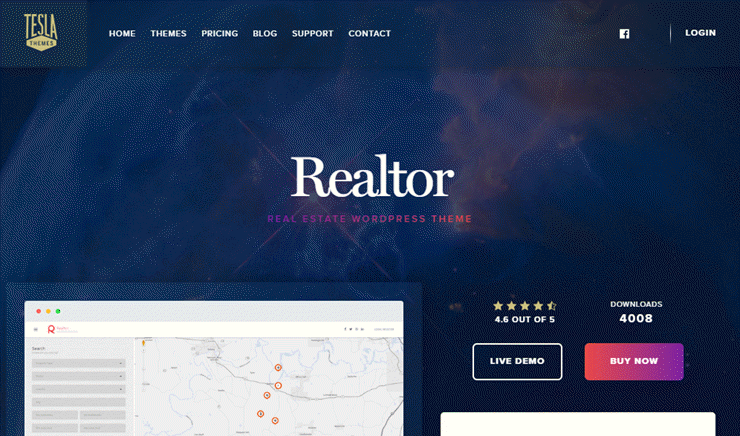 That’s why we’ve handpicked the 21 best real estate themes for WordPress just for you. Now you can stop worrying about choosing a theme and get back to what you do best! 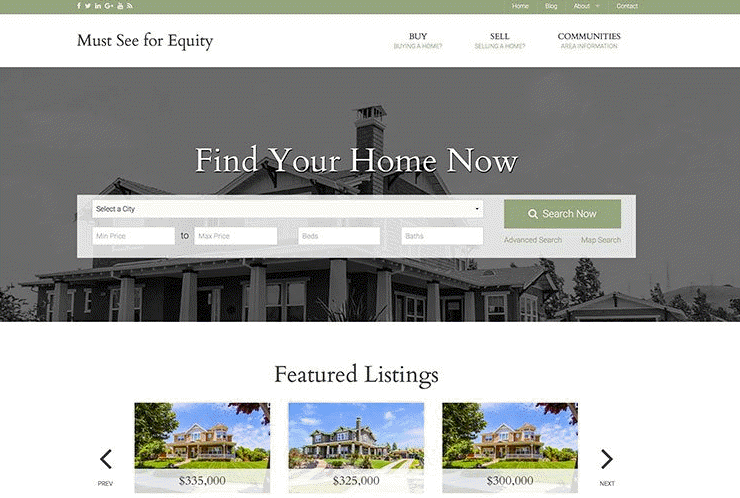 Bonus: all of the themes listed are mobile responsive, so your real estate website will look gorgeous on any device. Brought to you by StudioPress, AgentPress runs on their famous Genesis framework. It’s exactly what you’re looking for if “savvy” is the word you use to describe your business. AgentPress comes with its own listings management plugin, allowing you to create custom widgets, taxonomies, and post types. You can also customize the header so that your site perfectly matches your brand. Speaking of customization, you can alter the theme’s settings and color schemes as well. Plus, it has 6 homepage widget areas! This theme is easy to set up and start using, and even includes a live preview option to see your changes in real time. Get Started with AgentPress Today! Whether you’re on your own or part of an agency, Realtor is definitely one of the best WordPress real estate themes. It’s clean, modern, and ultra-stylish. You’re going to love its advanced property filters and search functions, and so will your customers. It even integrates with Google Maps’ API to create its own properties map. It’s super easy to list and sell properties with Realtor. The image upload function is buttery smooth, and we loved that you could customize the style of each individual property page. Get Started with Realtor Today! With its parallax scrolling photo background, MustSee is a classic website theme with a modern twist. You can choose from 4 color schemes to customize MustSee to your personal style. Plus, it was built on the Equity Framework, made specifically for realtors, for extra oomph. Get Started with MustSee Today! This theme has everything you’d expect from a real estate website and then some! It has numerous advanced functions that are all fairly easy to use, for both you and your potential clients. The search function is top-of-the-line, and EstateEngine makes it easy to upload properties and have clients submit properties. It’s also incredibly simple to monetize thanks to payment plans and ad options. We love that EstateEngine comes with its own drag and drop builder, making it effortless to customize. Get Started with Estate Engine Today! Sleek and silver, Residence gives off an air of luxury. If you’re looking for high-end clients, this theme is a great way to showcase your most valuable properties. Residence comes with dsIDXPress plugin integration, allowing your potential clients to search through the MLS with ease. We also appreciated that it comes preloaded with nearly every currency symbol you could ever need, making it easy to price your listings no matter where you are in the world. This theme also works equally well if you have multiple agents on your team. Residence gives each agent their own admin dashboard. Get Started with Residence Today! Search engine optimized and loaded with its own drag and drop builder, Oikia is incredibly easy to customize. There are widgets available for nearly everything, including social media links, content blocks, maps, and more! One of the best features included with Oikia is the ability to choose a different color scheme for each of your pages. Get Started with Oikia Today! Choose 1 of 2 pre-built home pages, add your own content, and get ready to sell! Elviria makes it easy to get your website running in a snap. Rather than the usual sidebar and footer widget areas, Elviria has options to add widget-ready areas to multiple sections of your website. This, along with its unlimited color scheme options, make it highly customizable. The listings carousel and image gallery options also add extra appeal to your site, enticing potential clients with eye-catching graphic effects. Get Started with Elviria Today! Customization is key with the Bahia theme. You’re going to love how easy it is to match your theme to your brand once you get started with this one. With unlimited color options and a custom header area, Bahia can be personalized in just a few clicks of your mouse. Plus, like its sister theme, Elviria, Bahia also includes a listings carousel and image gallery options. Get Started with Bahia Today! Flexible widget areas, unlimited color options, and a highly customizable header area are all part of what makes London one of the best real estate themes for WordPress. London comes with a ton of custom widgets including image sliders, featured content boxes, newsletter subscription optins, and call-to-action buttons. Based on the Bootstrap framework with some impressive jQuery scripts, London has a lot to offer. Get Started with London Today! If you’re running a real estate classifieds portal, then HomeQuest is the theme you want. Your clients will love its searchable map and other advanced search features. HomeQuest was specifically designed to earn you more money. With tons of different submissions packages, an option to claim properties, and several ad space areas; you’ll be raking in the dough in no time! Get Started with HomeQuest Today! By utilizing Bootstrap, Oslo packs quite a punch. It even has several jQuery scripts to make it even more powerful. You can use its pre-built homepage to get up and running immediately, or customize Oslo to your heart’s content with unlimited color options, header settings, and widget areas. Get Started with Oslo Today! This theme might be called Mainstreet, but you’ll think you just downloaded Easy Street thanks to its incredibly simple set up. The drag and drop builder makes starting your real estate website a breeze, letting you earn money in no time flat. Visitors can search the MLS thanks to the dsIDXPress plugin. Plus, you can display your listings in any currency. This theme works perfectly for multiple agents as well. Each agent will be given their own dashboard. Get Started with Mainstreet Today! 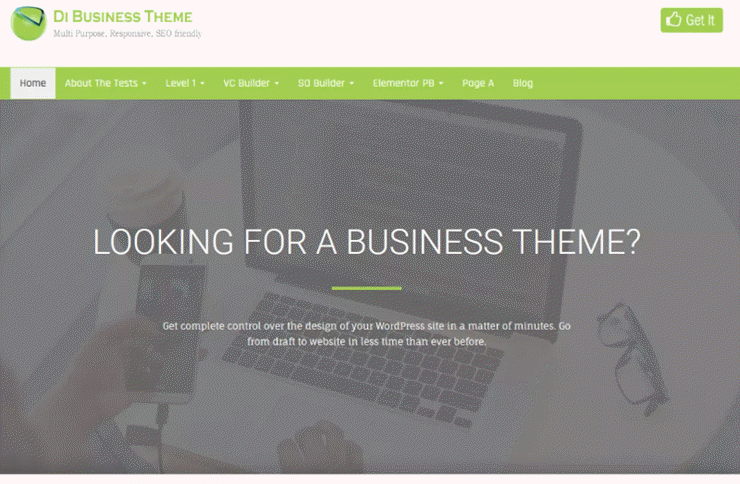 This free theme is one of the essential WordPress real estate themes because it’s a complete solution for your needs. This theme is translation-ready and highly customizable. You can customize the background, colors, logo area, menus, and header area. It also has multiple widget-ready areas, as well as options for 1, 2, or 3 column layouts. Get Started with Real Estate Lite Today! Real Estate Right Now is perfect if you’re selling properties in different currencies or languages. Plus, you can change your theme’s color scheme from dark to light with a single click of your mouse. You can choose from a full or boxed layout, and you’re given 3 footer widgets. For a free theme, it’s a great option! Get Started with Real Estate Right Now Today! New Estate can be downloaded for free for a full set of basic features, or you can upgrade to the premium version for even more options. The free version has everything you need for running a multi-agent website. You can even allow clients to upload their own properties. The premium version comes with a beautiful image slider, maps, and dedicated support. Get Started with New Estate Today! Di Business is WooCommerce ready and includes several templates, including a 1-click demo site installer. You can be up-and-running in no time flat! This theme is clean, modern, and customizable. We loved that it’s compatible with all the most popular page builder plugins. You can tweak your website to perfection with no coding skills needed. Get Started with Di Business Today! Whether you’re selling properties to buy or to rent, Real Estate 7 has got you covered! 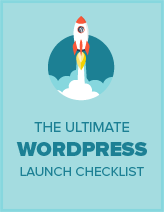 This theme includes plenty of plugins and even a 1-click demo installer to get your site ready quickly. The theme even guarantees top-notch support and free updates. Get Started with Real Estate 7 Today! If you’re looking to try a premium theme, but are feeling unsure, then you’ll appreciate MyHome’s 14-day free trial option. 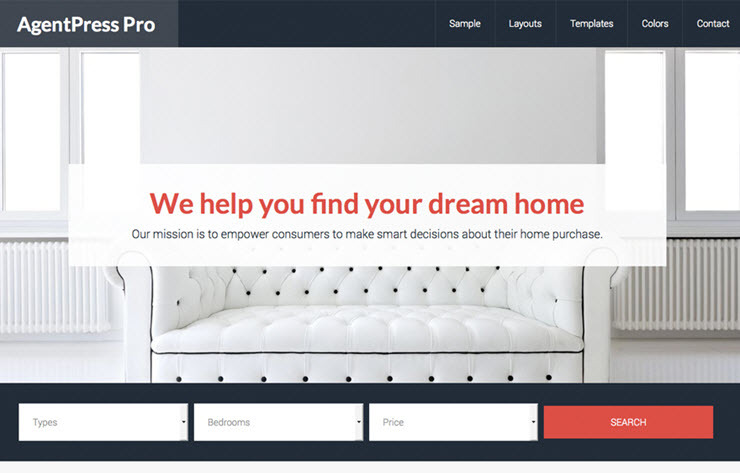 MyHome includes 6 1-click website demos, and 14 homepage templates. They boast that their included drag and drop page builder has even more modules than WPBakery! This theme can also be adapted for any currency or language. The advanced search functions include keyword autocomplete, map searches, and classic searches. Clients can also save their searches, if desired. This theme also includes plenty of options for images and videos, including a feature that allows you to do virtual property tours. Monetization is also a breeze thanks to WooCommerce integration and payment gateways for PayPal, Stripe, and direct bank transfers. Get Started with MyHome Today! Houzez is GDPR compliant right off the bat, and works well with WPBakery, the most popular drag and drop plugin, to make building your website simple as pie. This theme has also been fully translated into 20 different languages, and can be translated into more via plugins. Get Started with Houzez Today! This theme allows you to give your clients the ability to upload their own properties. You can let users upload their properties for free, or set up a fee for submissions. 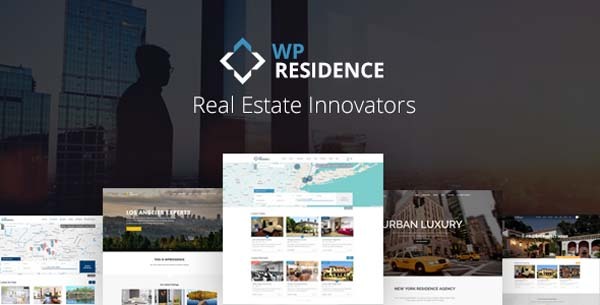 With over 400 theme options, WP Residence is highly customizable so you can make your website perfectly match your brand. Or, if you’re in a hurry, you can use 1 of their 12 pre-built demo sites and simply add in your own content. WP Residence has been translated into 32 different languages as well. Get Started with WP Residence Today! Real Homes has an advanced, customizable, properties search function that you and your clients will both appreciate. It also has a map search function that works with Google Maps’ API. We especially liked the compare tool that allowed potential clients to look at properties side-by-side. This theme has the option of using grid or list layouts to showcase your real estate listings. Plus, there are numerous image gallery templates! Real Homes includes its own child theme for easy customization with snippets, as well as a few premium plugins such as Slider Revolution and WPBakery. Get Started with Real Homes Today! 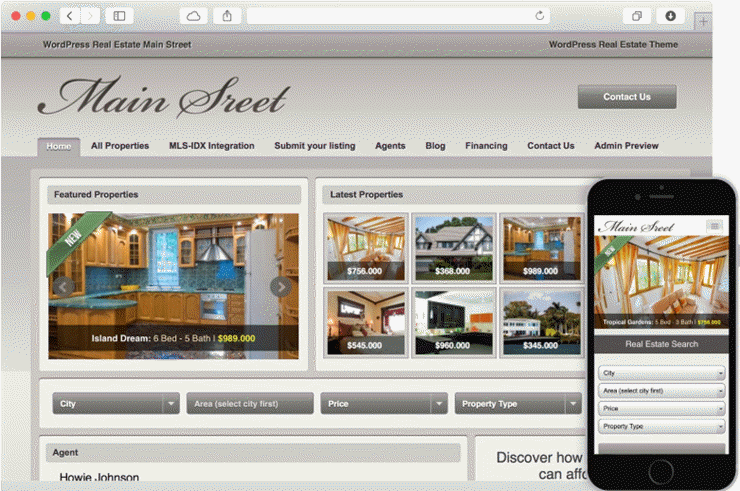 We hope this article helped you discover the best WordPress real estate themes! If you enjoyed this post, you might also like our comparison of the best WordPress events plugins.